By 9 o'clock this morning, Cliff Crochet had already caught 25 fish for 53-05. Cliff Crochet says he felt like he was step behind everyone at the first three Bass Pro Tour events. This morning, he lapped the field at Lake Chickamauga. 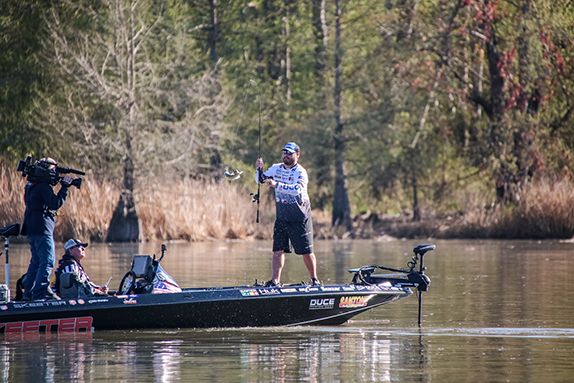 The genial Louisiana native set a torrid pace in the first period of the Group B Shotgun Round, catching 31 bass for 65-11, breaking the single-period weight record in the process. He caught only three fish for 3-11 the rest of the day, but he could�ve quit at 10 a.m. and still been in the lead at day�s end. His 69-06 total put him atop Group B and his 34 fish tied the single-round record also matched by day-1 leader Dave Lefebre. �That was fun, but it was all business, too,� said Crochet, who started the day by catching a 5-01 and a 3-10 within a minute of each other. Points leader Edwin Evers, who has qualified for the Championship Round at all three Bass Pro Tour events so far, was 22nd after the first period with 9-13 (four fish) then caught 24 over the final two periods to move up to 2nd with 55-02 (28 fish). 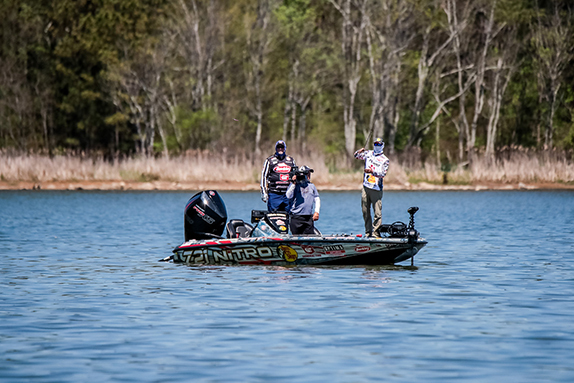 Zack Birge used a 30-pound third period (30-01 to be exact) fueled by a pair of 4-pounders to go from 18th place after the second to 3rd with 51-04 (23 fish). Fletcher Shryock caught 25 bass for 47-12 and sits in 4th while Michael Neal leads the Tennessee contingent in Group B (seven anglers hail from the Volunteer State) with 47-10 (22 fish) in 5th. Group B enjoyed a mild spring day as the sun beat down on the lake for the duration of the competition, but it didn�t help the sight-fishing bite all that much as sections of the lake are still fairly dirty. Thursday�s forecast calls for partly cloudy skies with temperatures near 80 and winds out of the south at 10 to 20 miles per hour. While Crochet�s finishes got progressively worse over the first three events, he didn�t get discouraged. That�s why having a day like today is so meaningful. Edwin Evers overcame a slow first period and finished the day with 55-02. He says he�ll enjoy sitting down one day and watching the GoPro footage of his first period from today, but for now he�s focused on what Friday and Saturday hold for him. That�s why he spent the second and third periods exploring and checking on other areas that caught his eye during practice. He said the action was so furious in the first period that he didn�t realize how much weight he�d piled up until later in the day. �We had calm conditions, so I did what I did to generate some bites,� he added. Action picked up for him in the second when he totaled 25-02 (13 fish). What surprised him, though, was that he didn�t connect with anything bigger than 3-14. Looking ahead, he said he�ll need to be prepared to alter his approach with rain in the forecast for Thursday night. 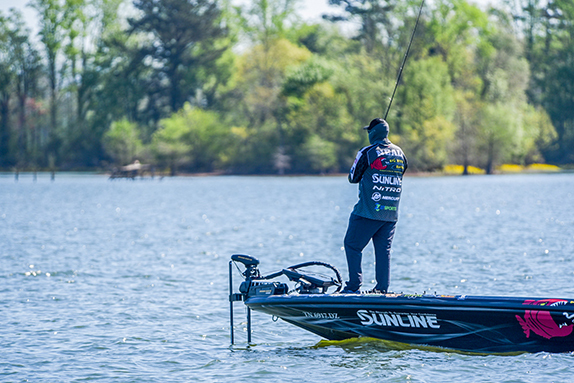 Michael Neal figured the fishing would be better today, but his confidence remains strong. Neal said the fishing quality didn�t meet his expectations, but he�s still pleased with where he sits after the Shotgun Round. He moved through five or six areas that are confined to one section of the lake. He started strong with 23-02 in the first period, bolstered by a 6-01 and a 3-10 within a minute of each other. After 9 a.m., he didn�t catch anything bigger than 2-07. The challenge that awaits Friday will be how BPT anglers co-exist with anglers practicing for the Chattanooga Bass Association event on Saturday. 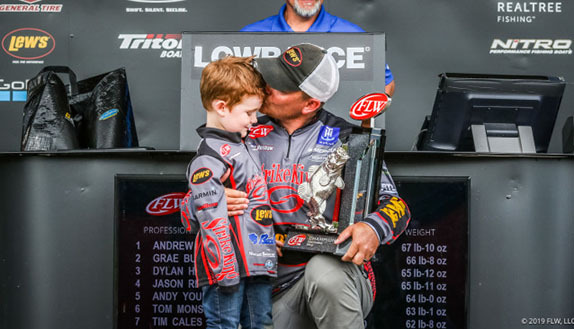 �For me, the challenge will be on Saturday when the local tournament goes out of the lower end and I know I�ll be fishing the same stuff as guys in that tournament,� he said. 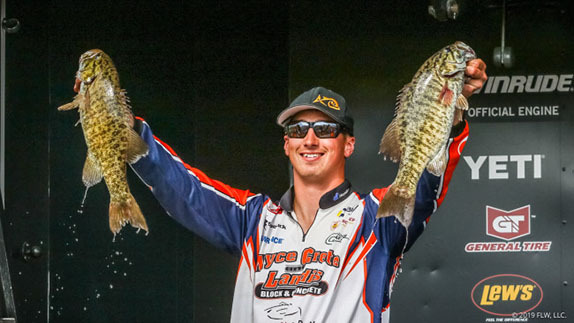 In most Bass Pro Tour events, catching 17 fish for 31-08 would constitute a solid day. Not at Chickamauga in April. 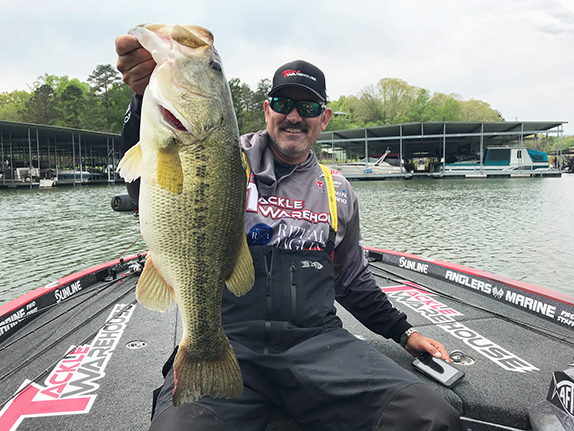 Andy Morgan knows as much, which is why the three-time FLW Tour Angler of the Year wasn�t thrilled about where he sits after the Shotgun Round � 21st place, nine ounces outside the top-20 cut. His first fish all weighed less than 2 pounds, but seven of his last eight were above that threshold. > Day 2 stats: Period 1 � 265 fish, 529-06; Period 2 � 189 fish, 368-06; Period 3 � 207 fish, 411-14; Total � 661 fish, 1,309-10.